It’s no secret that Apple is set to release the iPhone 5 on September 12th, and despite the ongoing patent disputes that the Cupertino company has recently released on Android OEM’s (particularly Samsung), their main focus over the next few weeks will shift to their newest flagship device. Samsung however, is not about to take this sitting down, as their legal teams are currently preparing for all out nuclear warfare on Apple’s upcoming flagship phone, and have stated that if the new iPhone includes one particular feature, that they will be suing Apple in an attempt to ban the next iPhone. How does Samsung plan on accomplishing this? With three little letters: LTE. LTE (aka 4G) isn’t something new to Android phones, yet Apple has yet to include the feature in any previous iPhone. The exact reason for that isn't clear, but it could be because of the 819 LTE patents that Samsung currently holds. Interestingly enough, Apple didn't register one solitary LTE patent, and Samsung has stated that if the next iPhone is released with LTE, that they will sue the Cupertino company. Samsung was recently ordered to pay Apple a whopping 1 billion dollars for patent infringement, and although Samsung still has options for turning the case around, they are certainly looking for ways to give Apple a taste of their own medicine. With the number of LTE patents that Samsung holds, it could be their strategic way of telling Apple “we also have patents, and can also request bans”. But are they enough to ban the most popular mobile phone in the world? Catch Apple off guard by attempting to ban their newest iPhone? Hit the brakes for a minute. One thing that Apple certainly isn't is a dumb company, and if they do plan on releasing an LTE version of the iPhone, they have most likely anticipated and prepared for Samsung’s attack (to an extent). How? By developing and purchasing their own LTE patents. Apple has recently registered 318 LTD patents, and of those 318, 44 were developed directly by Apple. They purchased the rest from Nortel and Freescale last year, and with their majority stake in Rockstar Bidco, who currently holds 116 LTE patents, brings the total amount of LTE patents to 434. In other words, Apple has a little over half as many LTE patents as Samsung, but are now effectively one of the top 10 biggest LTE patent holders in the world. 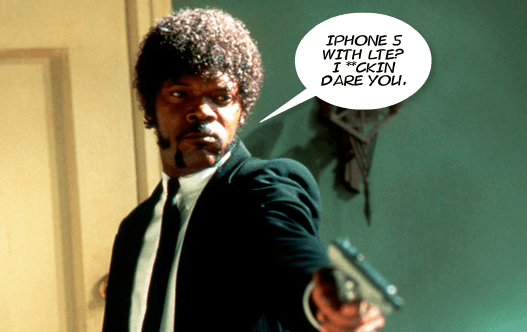 Enough Patents For An iPhone Ban? That’s questionable. Apple does have a small blanket of protection with its current LTE patent portfolio, but it’s hard to say how much protection they can provide. That being said, aren’t essential LTE patents covered under FRAND? If yes, wouldn’t fair use laws apply here? And isn’t it likely that Qualcomm, the company that manufactures Apple’s LTE chipset, has taken care of licensing BEFORE supplying the chips to Apple? But then again, if Apple can sue over corners and icons, surely Samsung can sue for complex LTE technology? One thing is certain: The iPhone 5 is coming soon (in 7 days actually),regardless of Samsung's threats. Samsung is gearing up to take on the most popular phone in the world, which is essential to Apple’s revenue and growth. Apple does not have the luxury of generating sales from 10 different phones. If its bread and butter were to even see temporary bans, it would definitely sting. Will Samsung have what it takes to pull it off? Will Apple even release an LTE iPhone 5? Is the patent in question a viable loophole that Samsung can use to their advantage? I guess we’ll see on September 12th. @Glostermeteor, well to be fair, the patent system is there to protect rights. Anyone who's rights are violated, should definitely go to the courts for redress. Nothing wrong with that. However, when the system is being abused to create unfair competition and give an unearned advantage to some then there is a problem. Granted, Apple has patents - over scroll bounce, slide to unlock and a rectangle with rounded corners. Samsung has its own - various components for LTE tech, among others. One set of patents makes your phone pretty. The other set allows your phone to be a phone. Imagine the iPhone without Samsung and Sony tech. Its gonna end up like a pretty Huawei. The courts should rectify this situation and save apple from itself. @Glostermeteor - I really get where you're coming from, and I can't really say that I'm overjoyed in Samsung taking this stance. But in all honesty, do they really have a choice after the stunt Apple pulled? They are seeking bans on multiple Samsung products AND Samsung's flagship device (that actually outsold their own). Sorry, but I can very much understand the stance Samsung is taking here. Apple wants The GS3 out of the way because it has outperformed their current flaghship, and they are attempting to do it in the dirtiest way possible. I don't really see how Samsung has much choice in the matter. Very sad if Samsung drops to Apple's level and tries to ban. All these patents are ridiculous and should be scrapped. @Patrick - I have always wondered the same. I mean, this isn't some tiny company Apple is picking on. Samsung is a huge corporate entity! And what you said about the word technology is sooo true. I wish more people would remember the real pioneers. Apple also kinda bought into that "we innovate" cr*p they spew out. What they hold are cutsie I make pretty phones patents. Companies like Samsung, Motorola, Intel, N Vidia, Xerox, Palm et al put TECH in the word technology, hell, they practically defined it. They invent, design and manufacture the components that makes a phone, pc etc what they are. They wrote the word TECHNOLOGY in big bold black letters. Apple maybe wrote it in script and in pink. Pretty to look at, but that's it. This is getting interestng. Apple poked a sleeping giant. Their success kinda got to their heads. I kinda think they forgot Samsung is in fact a conglomerate that is considerably bigger than they are. They maybe bought that line that Sammy lets its diivisions run independently. We all root for the small guy in David vs Goliath battles, well maybe not if it is David who's being a jerk. I want apple to be sued! They cry over the icons? Seriously?